This is the perfect weather to pack up and head to your favorite park, lake of down the shore and enjoy a picnic. 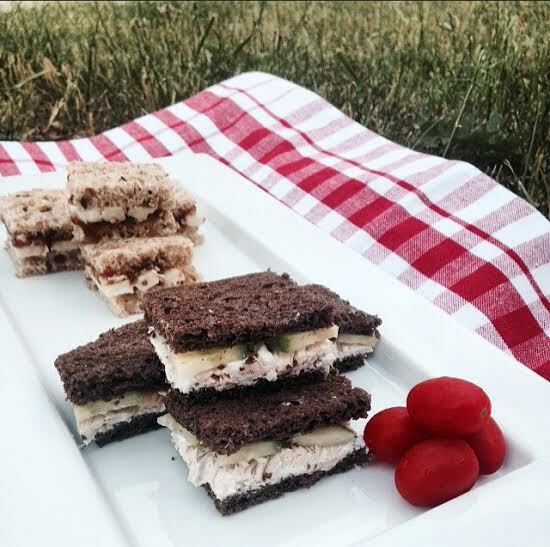 One of my favorite little things to pack and make are mini tea sandwiches. You can get super creative with these little cuties from sweet and savory to a traditional sandwich. People of all ages will enjoy them. I personally enjoy them with a glass of prosecco. I hope everyone is enjoy the warm weather. Take the four slices of bread and spread the apricot jam on 2 slices. Next lay cheese on top of jam and sprinkle mint, place the other 2 slices on top. Cut into mini squares and serve or pack up. Take 4 slices of bread and spread cream cheese. Next top with chicken and cucumber. Take last 2 slices; top and cut into mini squares. Pack and enjoy.